One of the biggest challenges facing workplaces globally is effective communication within, across, and outside, teams and the organisation. Technologies to date have focused on productivity and collaboration but fail to engage emotionally or in a more human way. Email overload means email doesn't get read, or gets deleted. Email goes into the junk/spam folder. Old or out of date emails bouncing. Clunky to manage larger group emails/lists. Can become very one-way / broadcast. Emails are fine for simple circulation of documents to a small group. Not so long ago if you wanted a 'proper' form of communication you did it in writing because email was not legally binding and was too informal. That has changed. Today Email is the new ‘send it in writing’ medium. Become too noisy, and an increasing emphasis on advertising (sponsored InMail, sponsored stories, job ads, elearning etc). Now more about marketing oneself, or your business, than networking with others. Reducing features for managing groups. 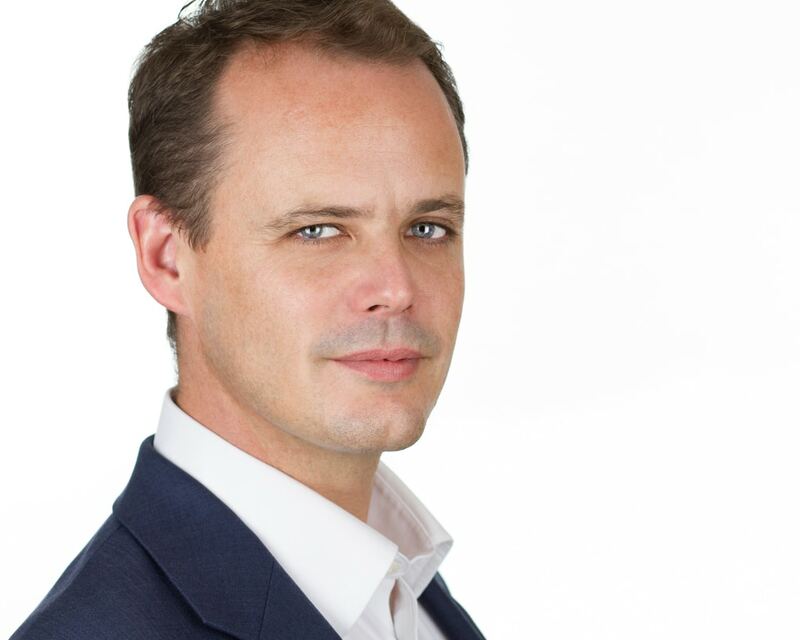 LinkedIn has become a 'must have' platform for professionals and remains effective for recruitment and marketing but risks being a victim of its own success by becoming too noisy and low quality. LinkedIn is becoming more like Facebook. Reducing engagement/usage due to preference for mobile/app access rather than desktop/web. Communications based on intranet or extranet platforms were rarely as effective as hoped in any case but the rise of mobile is hastening the demise of web-based group communication. Mobile killed the web-based star. Slack – works well for small, distributed teams, but particularly when used across businesses, or for senior executives, becomes too busy, confusing, overwhelming. WhatsApp – significant organic growth as a professional communications tool despite being designed for consumer use. Increasing business backlash now as outside the control of company policy, can be ‘overwhelming’, ‘gossipy’, risk of inappropriate behaviour, confusion with personal life, advertising is being introduced, not GDPR compliant, etc. Various CRM/staff directory type systems – may work fine for email-based transactional communications (e.g. alerting staff to a major incident) but no good for engagement. The image below outlines what we believe is a new category of workplace technology which focuses on engagement, emotional connection, and nurturing very human emotions like trust, reciprocity, belonging and good will. 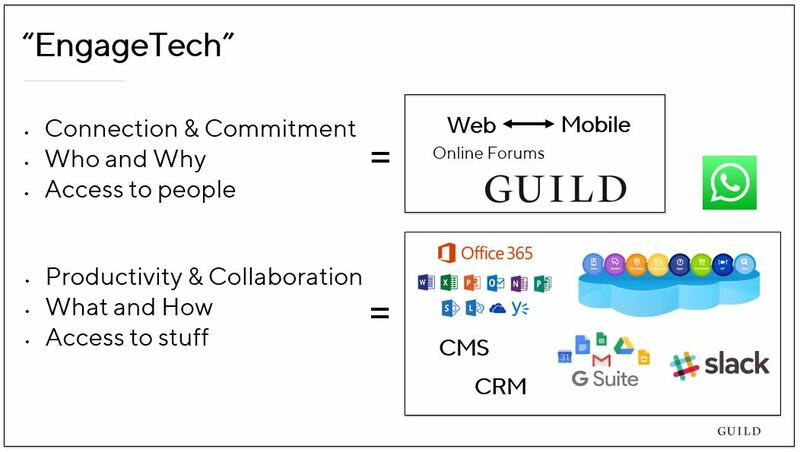 Existing technology platforms and tools are about productivity and collaboration. EngageTech is about connection and commitment. Existing tools focus on what and how. EngageTech focuses on who and why. Existing tech gives access to stuff. EngageTech is about access to people. The intimate, immediate, nature of mobile messaging lends itself very well as a medium for engagement. If done well, it can help foster higher levels of intrinsic motivation (like Dan Pink's autonomy, mastery, purpose) by creating improved connection and commitment to a particular group, or purpose, or interest. We also know that digital nomadism and remote working is increasingly popular, particularly among the next generation of employees. Communication tools are essential to improve their sense of belonging. Clearly mobile is the natural medium for more mobile professionals. Instantly tap into the collective experience of peers. Feel/tone is both instant and informal as well as more supportive, engaging, more diverse/inclusive. Mobile “flattens hierarchies”, so junior and senior colleagues are more likely to mix, and start to bond/trust each other. Fits in with emerging agile/fluid ways of working. Especially valued by professionals who are out and about in their jobs. 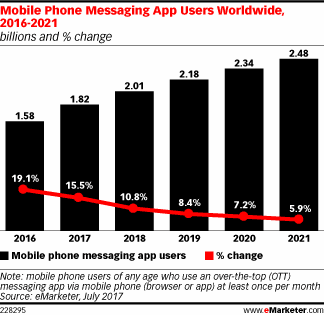 We know that messaging is experiencing huge growth: 25% in the next three years according to eMarketer and "in-app activities will make up 89.2% of US adult smartphone users’ time spent accessing the internet via smartphone this year." However, an Ovum study found that while 47% of respondents would like to enable employees to usage a messaging app, they "did not believe that the use of consumer messaging apps would allow them to comply with relevant industry regulation". Guild conducted research asking professionals about their mobile app messaging usage and found that of an estimated 650 million people worldwide using WhatsApp for work purposes, 500 million want a work-specific messaging platform. Conclusion: the opportunity is there to use mobile messaging to better engage with other professionals, in a way that fits with new ways of working, but the current options available are not fit for purpose in a professional context.